Rep. Kathy Castor, newly appointed chair of "Select Committee on the Climate Change" blocks green initiative to disallow those taking money from Big Oil & King Coal from sitting. - Such a ban may be unconstitutional. - A ban would prevent “reformed” legislators — who can be strong examples to others — from sitting. - Castor has years of congressional and environmental experience. So she knows how things work in Washington. We don’t have time to waste on fights that cannot be won quickly. NIMTOO, or how skewed is your mental model? Should we sue our governments and corporations? Civil disobedience? Posted 20181220 124 views now. Adding screenshots, Rio 1992 and the final words. In a special “Meet the Press” episode dedicated to global warming, NBC’s Chuck Todd said he wouldn’t indulge anyone who ignored the facts. The host delivered the message on his Sunday broadcast, which opened with footage of the destruction bred by fires and flooding. Would it be "unconstitutional" to ban those beholden to Electric Chair Manufacturers from sitting on a committee attempting to end Capital Punishment? Which "reformed" bought and paid for representatives of Big Oil & King Coal have turned their backs of the industries that financed their campaigns. Would you trust their loyalty now, when they've already shown that they aren't even capable of remaining bought? What kind of "example" do you wish to dangle in front of prospective candidates. "It's OK to take bribes from the enemy, as long as you later pledge to betray them?" Pelosi's hypocrisy may reach new highs in lockstep with her families wealth and the worlds temperatures. All may surpass previous records in the year ahead. U.S. Republicans take another tiny step back from outright climate change denial. GOP lawmakers are increasingly turning to a new refrain for their position on climate change, calling for "innovation" as the policy solution. The strategy is the latest in a string of Republican responses to climate change and to the left's repeated accusations that the GOP, which has controlled both chambers of Congress and the White House for the past two years, is failing in its governance duties by not taking stronger action. Previous strategies have included politicians pointing out that they are "not a scientist" and that man's impact on the climate is unclear. Isaac Dovere: Where do you see the politics of climate change right now? Al Gore: I think that we are extremely close to a political tipping point. We may actually be crossing it right about now. The much-vaunted tribalism in American politics has contributed to an odd anomaly, in that the core of one of our political parties is uniquely—in all of the world—still rejecting not just the science, but also the messages from Mother Nature that have pushed toward, and perhaps are pushing across, this political tipping point right now. More and more people on the conservative side of the spectrum are really changing their positions now. This election, in 2020, is almost certainly going to be different from any previous presidential election in that a number of candidates will be placing climate at or near the top of their agenda. And I think that by the time the first primary and caucus votes are cast a year from now, you’re going to see a very different political dialogue in the U.S. The climate-related extreme-weather events are causing millions of people who had successfully pushed this issue into the background and into the projected distant future to now be finding ways to talk about it and to express their deep concern. On Thursday, Florida’s newly anointed Republican governor put his words to action, announcing plans to open a new resiliency office as part of a sweeping environmental rollout that includes an extra $1 billion for Everglades restoration and water cleanup — without mention of climate change or carbon emissions. In a state threatened by saltwater intrusion and suffering from red tide and toxic blue-green algae blooms, DeSantis’ green platform received bipartisan applause. He’s opposing fracking, creating a new office to integrate scientific research into the state’s environmental policies and pushing to quickly begin the process of cleansing the state’s distressed Lake Okeechobee. For some environmentalists and Democrats, the proposal fell short of hopes. But even so, DeSantis still managed to exceed critics’ expectations by indicating that a state where former Gov. Rick Scott banned environmental regulators from using the phrase “climate change” is now willing to work to at least combat the symptoms of an existential problem. Hundreds of environmental organizations signed a letter Thursday backing a rapid transition away from fossil fuels in the United States. The groups, led by organizations like Friends of the Earth and the Climate Justice Alliance, told members of the House in the open letter that lawmakers should pursue the Green New Deal, a climate change-fighting concept that calls for 100 percent renewable electricity by 2035 and the decarbonization of other major industries. “As the Intergovernmental Panel on Climate Change recently warned, if we are to keep global warming below 1.5°C, we must act aggressively and quickly,” the groups wrote. Wolf issued an executive order on Tuesday to set the state's first economy-wide targets for reducing greenhouse gas emissions. Thousands of students have skipped school in Belgium to join a march demanding greater action on climate change. About 12,500 young people took part in Thursday's protest in Brussels. They have vowed to return to demonstrate every week until world leaders take notice. Yesterday we had more than 20.000 protesting kids here in Germany-in 55 cities. no matter how just the cause, to instumentalize kids is IMO always wrong because there is no clear limit to such instrumentalization i assume that none of the kids hat the idea and went there on it's own but was in one or another or several ways abused by their parents. as i said, causes may be just but the means are not and that causes justify means is part of the problem we're discussing here, means the cat is hunting it's own tail. i recommend all those parents to reduce their own and their families energy and resources footprint first, sure most of the kids have mobile phones and are driven to school etc. etc. BTW why "even tagesthemen" is that a qualification ? for my understanding what's in the news is closer to being a disqualification than the other way around, at least i more often have to switch channel or news off than switch channel or news on. this is kind of arbitrary main stream choosing a group to belong but ultimately nothing else than choosing a church/religion or any other social group to belong, mostly ending in hypocrisy. Wait, what? What do you mean instrumentalize kids?? These kids are scared because they know about science. This is told in Germany. Also, evolution and Kant btw. Rest assured, these kids are not instrumentalized! They have their own brains. BTW why "even tagesthemen" is that a qualification? In Germany we have something called "Öffentlich Rechtliche Medien". Tagesthemen/Tagesschau is the top news show there. We all pay to finance independent media. The ÖRs are a well-trusted news source in Germany. I also don't believe that kids have been instrumentalized. As teenagers, we were protesting mainly for human rights (apartheid...) and nobody was making pressure on us. My parents didn't really want us on the streets. Of course, one day out of school might sometimes be a motivation. I remember stories where a journalist said that all the people in the protest had a new hat, it was is some Asian country, don't remeber which one, but here it is clearly not the case. Teenagers are often able to put common interest before their own. This is mainly true as long as their parents are taking care of all the material aspects of life. Thank you, etienne. As a loving mother, caring for my kids and the planet, I know that it is a basic instinct of children to think sometimes further than a lot of adults. They love nature, they have a natural sense for injustice-for humans and animals. Kids on the street had not been influenced-here in Germany they are told about climate science, they are free to use their own brain and to raise their voice-even if some ministers of education already theatened them with sanctions. Yes, every family should take personal action-but here in Germany awareness and action of private persons is al lot higher than in politics. We have politics, shameless influenced lobbyism of energy companies and car industry. All had been done to act in their interest, not in the interest of the young generation. And how should that generation have hope, what should them give optimism? There has to be political pressure. Maybe parents should join their kids-that would be the appropriate criticism. When we were getting our young heads split open trying to end the Vietnam debacle, one of our cries was "Never Trust Anyone Over 30." It might still be a worthwhile maxim. Well, Vietnam war just like apartheid ended, so we should wish the new generation a lot of success. As a bloodied survivor of the Vietnam protests I do wish them every success. I don't know how they'll achieve it, but our parents didn't believe that we could end the war, or stop South African apartheid. Senator Elizabeth Warren, who has announced she is running for president in 2020, speaking in South Carolina. 2-minute video clip of her on stage, speaking to a group, at the link. It is really nice to know big business will look after us as it hits the fan. As Merck notes in its disclosure to CDP, climate change may lead to “expanded markets for products for tropical and weather-related diseases including water-borne illness”. AbbVie sees similar opportunities, saying that its “immunology product line could see an increase in sales” as a result of more extreme conditions. And Eli Lilly, another large pharmaceutical company, cites research showing climate change may increase the risk of diabetes by “curtailing physical activity, disrupting traditional food supplies, and increasing food insecurity”. ... the upside for Eli Lilly is a potential increase in demand for its diabetes products. Honda reckons its generators may empower its consumers when the world’s infrastructure crumbles. The company notes that “the Katrina disaster was followed by a 27% increase in unit sales of [Honda] generators”. Meanwhile, the Home Depot is optimistic that, at the very least, it will sell more ceiling fans “should temperatures increase over time”. Apple thinks that “as people begin to experience severe weather events with greater frequency” they will become increasingly glued to their mobile phones. It notes that, as well as helping you check in with your loved ones, your iPhone can “serve as a flashlight”. Which takes the idea of seeing the bright side of a bad situation to a whole new level. My wife wanted to try out a new church this morning and the sermon was on climate change and referenced the work of @KHayhoe several times. Thus far, 107 American cities have committed to the Sierra Club’s Ready For 100 campaign. Chicago will be the largest city on the list when it’s officially added. The new project is set to run 5.3 miles along Staten Island’s Eastern shore. It’s actually not technically a “wall,” and it will eventually be composed of a system of interconnected levees, berms, and seawalls, designed to combat both storm surges and rising sea levels. But as climate change proceeds at an increasingly destructive pace, the more traditional ways of measuring storm severity — once every 100 years, every 300 years, every 500, etc. — and the ways in which those designations inform our seawall design could quickly become outdated. Hurricane Sandy, after all, was a once in a century storm. The Staten Island seawall is built for a once-in-300 year storm. But a report released last year by the Regional Plan Association found that those “every 500 years” floods New York has been slow to protect themselves against? They could start happening once every five. When they say sea level rise they usually refer to global average sea level rise. Global average might be informative in terms of meta solutions but in terms of actual solutions is not informative. A global average hides the fact that some places will experience less SLR and other places more SLR based on topography alone. When you add SLR multipliers like storm surges from climate changed hurricanes, high tides and torrential rain on land suddenly what was an cm of sea level rise becomes a meter. A city like NYC must embrace sea level rise and build useful infrastructure that also helps with SLR when the time comes. It will be too expensive and impractical to build defenses only. The defenses must play a role in the city day to day. NYC can do it. They have great people and vast resources. What's New in Climate Change Acceptance and Action ? wow. Now I know what civilized foreigners feel when they look at Trump's America. They don't even dare to talk about it. At the very least, a presidential candidate running primarily on climate change issues can do a lot to advance the national conversation. If he’s able to stay in the race for any length of time, and speak passionately — and effectively — about climate change, it should be a net positive for the country. With Thursday’s announcement, Maine becomes the 22nd U.S. state or territory to join the U.S. Climate Alliance. Mills makes Maine the third state to join the Alliance in the past month, following Wisconsin and Michigan. New York City Mayor Bill de Blasio is announcing a plan to protect lower Manhattan from rising sea levels by surrounding it with earthen berms and extending its shoreline by as much as 500 feet (152 meters). All across this country, cities are grappling with the same existential threat. But nowhere in the $4.75 trillion budget President Trump just proposed is there anything approaching a plan to protect our coastal cities from rising seas. This is a national emergency without a national policy. And that has to change. As for funding such an ambitious project, the mayor admitted that the city wouldn’t be able to go it alone, but that President Trump also wouldn’t be willing to contribute. He then called on Democrats to make the project part of their national agenda, to work towards allocating federal funds, and to fast-tracking the extension. 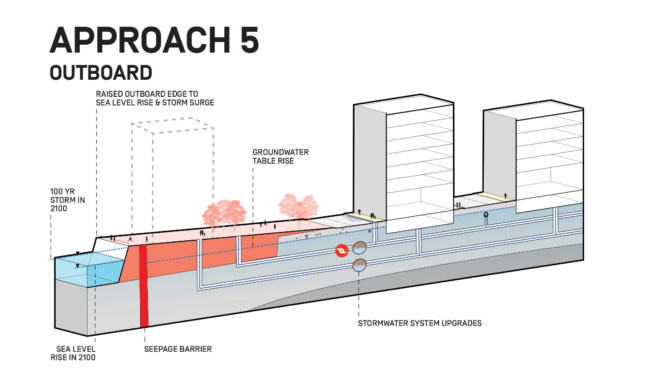 Alongside the resiliency study, the city also released the third iteration of their Climate Resiliency Design Guidelines, which architects and planners can use to future-proof their projects. 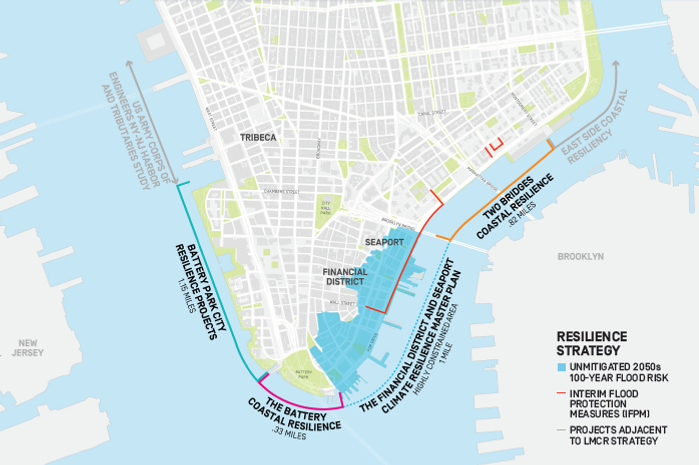 The study found that by 2050, 37 percent of properties in Lower Manhattan will be at risk from storm surge. 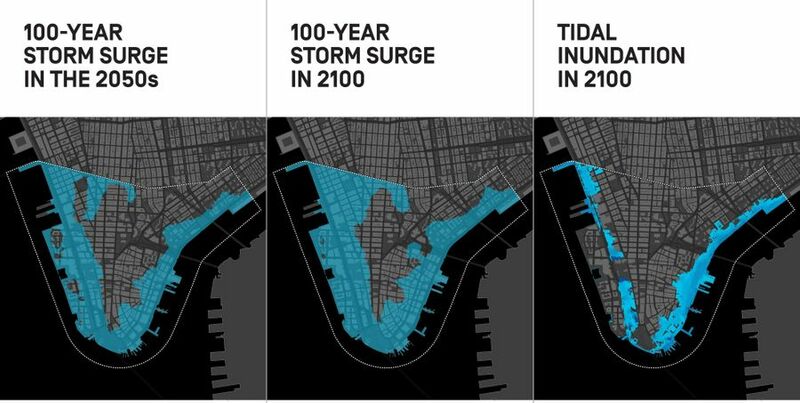 By 2100, with over 6 feet of projected sea level rise, almost 50 percent of properties will be at risk from storm surge, and 20 percent of Lower Manhattan’s streets will be exposed to daily tidal inundation. Groundwater table rise is projected to put 7 percent of buildings at risk of destabilization and expose 39 percent of streets with underground utilities to corrosion and water infiltration. The Washington Post spoke with kids around the country about who they are and why they're striking. They told stories about climate change touching their lives, shared photos from their social media accounts, and explained why they are no longer willing to wait for adults to act on their behalf. Their interviews are edited for length and clarity. [...] Germany, Poland, Hungary and the Czech Republic have refused to specifically link EU climate action with the 1.5°C objective. They also oppose any time-bound commitment to the EU’s climate neutrality objective, deleting any reference to 2050 for reaching that goal. So much for Schellnhuber's rapid decarbonisation plan for Germany? Some politicians say here in Luxembourg that objectives have been set so high that they are not reachable. It would be a short term strategy to explain us that the government takes the matter seriously, and in the future it would be easy to explain that the objectives have been set so high that it was not reachable. So maybe we could say that Germany and eastern countries are more honest than the others. Earth Hour returns this Saturday, March 30, 2019, as organizers ask participants to turn off their lights for one hour. This year’s Earth Hour takes place at 8:30 pm, your local time, wherever you may be. The event aims to bring awareness to environmental issues, such as climate change. It looks a little bit like a "vote leave" t-shirt in the Brexit context.